Congressman (N.Y. Dem.) 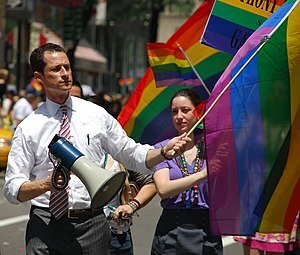 Anthony Weiner has shown himself to be … well actually …. has “shown himself” ….. period. I, like most people, have read or watched the media strip him bare (oops, a double-entendre), but unlike most bloggers, I haven’t blogged my thoughts or opinions. That is, until now. I thought I had better get this blog out before this latest political faux pas becomes stale and yesterday’s news for real. And I also realize that you can’t write or talk about this guy without double-entendres popping up (see what I mean) everywhere. The man is a double-entendre. So, I challenge my readers to read my blog and count how many double-entendres you see, and report back. While this particular entry is about “the Weiner” (not going there); it is also about the response of some politicians, the media, and the general public. This last week and weekend, I have heard so many comments referring to “truth.” I have heard comments like … “Well, at least he did admit that he sent the pictures and that they were of him,” and some said…” we should give this guy a break …after all, he did tell the truth … finally.” I have also heard some in the media, politicians and even some whose political careers were destroyed due to scandal say that if he had just told the truth to begin with, this would have eventually just gone away. The man is a narcissist who likes to get naked and take pictures of his “weinie” and send it out to social websites. This is what is repugnant and a just a bit sick (in my humble) opinion, and not whether he lied about in the beginning. Of course he is going to lie about it if he thinks he can cover it up. Imagine that …. a politician who lies and covers up his actions (sigh). Nor does telling the truth make him more likable or excusable. Seriously folks, while we hate being lied to … we all have told a few lies in our lifetime, when it served our purpose. I mean, we were all teenagers at one time or another. Let me just express it this way. If my dear hubby had done what Weiner did and ….in the name of truth … come home and greeted me with “Hi honey, guess what I did today!” …his life would have just gotten …. shorter. And I say that with …. certitude.